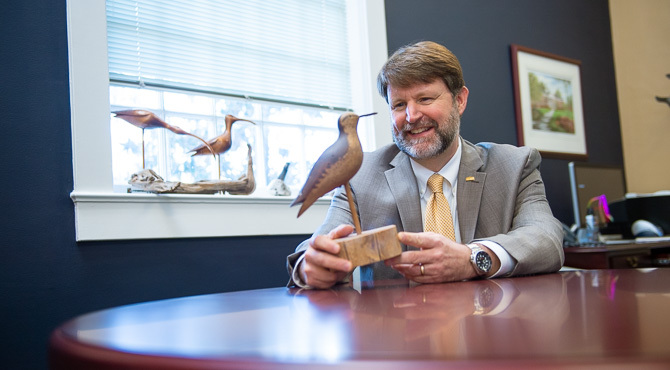 Carvings of shorebirds and wooden decoys, many of them crafted by his father, rest atop a cabinet and on the windowsill in Eddie Stuart’s office in Alderman Hall. They remind him daily of his upbringing in northeastern North Carolina. That link to his roots is important to him, and, as vice chancellor for university advancement, he sees the same desire for a connection when he works with prospective donors to UNCW. While he oversees the division responsible for raising money to support student scholarships, faculty research, academic programs, athletics and more, Stuart sees his primary role as that of a relationship builder. “People who give to a university do so because they feel a strong connection to the institution and its mission,” he said. Stuart and his team cultivate those relationships in part by sharing stories of UNCW’s successes, its ties to the community, the students who benefit from donors’ generosity, and the research that leads to tangible benefits for North Carolina and beyond. Stuart did his undergraduate work at Elon University, where he earned a degree in strategic communications. After graduation, he discovered that his skills were suited for the nonprofit sector, and eventually found himself working with prospective donors. He came to UNCW in 2000 as director of development in the College of Arts and Sciences and later joined the University Advancement team. While at UNCW, he earned his Master of Public Administration degree in 2005. He was named vice chancellor in 2013. During his tenure as vice chancellor, UNCW has received two record-breaking gifts: a five-year, $5 million commitment in 2017 from Yousry and Linda Sayed and Quality Chemical Laboratories for new programs in chemistry and pharmaceutical science, followed by $10 million in November 2018 from David Congdon ’78 to establish the David S. Congdon School of Supply Chain, Business Analytics and Information Systems. But UNCW doesn’t focus only on securing large donations. The “Give More in 24” challenge on April 9 provides an opportunity to underscore the importance of gifts of all sizes. The time-limited event, now in its sixth year, is designed to spark enthusiasm – and a spirit of friendly competition – among alumni, students, faculty, staff and friends of the university. Part of the purpose of “Give More in 24” is to reinforce the importance of gifts, regardless of amount, Stuart said. Last spring, the one-day event raised more than $160,000 from 1,344 donors – alumni, students, parents, employees and friends of the university. More than one-quarter of the total came from gifts of $100 or less. “Events like ‘Give More in 24’ bring the university community together for a common goal focused not on how much one gives, but on the spirit of giving and building on a mutual connection to UNCW,” Stuart said.